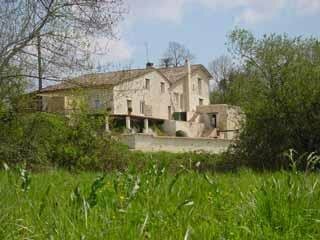 Description of Property: Les Roches is a beautiful stone farmhouse boasting character and charm, restored to the highest standard offering every modern convenience. Les Roches has been designed for all year round living, with central heating, log burning stove and sauna for the winter months. Throughout the year the impressive roof terrace opens from the living room with views over the valley to the village church and down to the heated pool nestled in natural rocks. A poolside summer kitchen with BBQ and Sauna complements an equipped farmhouse kitchen. 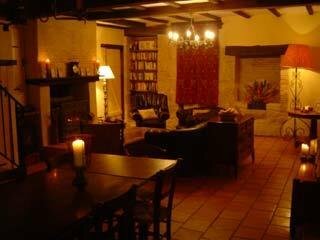 There are 4 bedrooms in the main house, all with ensuites. 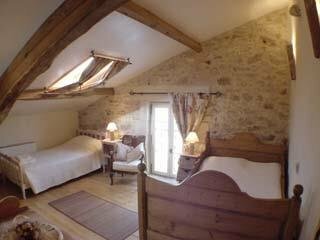 Attached to the farmhouse is 'Petit Roc' a separate studio, with a large living bedroom area, (1 double and a daybed), kitchenette and ensuite shower room. Across the road are two additional properties converted from the original farm chai (wine store). Each has central heating and a log burning stove. The Chai has 4 bedrooms, one with an ensuite bathroom and dressing room with French doors onto the pool. 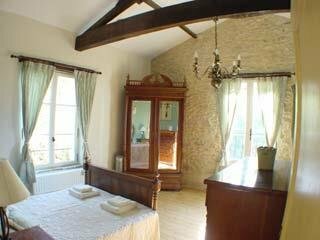 The Petit Chai has 1 bedroom with ensuite shower room. There is an additional bathroom with roll top bath. The open plan living dining area is of double height with a mezzanine level study. There is a sofa bed in the living area for occasional guests. Outside Amenities: Les Roches is ideal for outdoor living. French doors from the living room open onto a large roof terrace, with long tables for dining throughout the day. From the terrace steps lead down to the fully enclosed heated 10m by 4m saltwater swimming pool. Opposite the swimming pool there is an outdoor summer kitchen. There is a BBQ, fridge, sink etc. Also at pool level is the sauna and shower/changing room. The gardens include a children's play area with swings/slide and sandpit. There is private parking to the front of the property. Le Chai has a sun terrace and 4m pool accessible directly from the principal bedroom. There is a large private garden and parking area. Le Petit Chai has a patio area with table and chairs and a parking area. 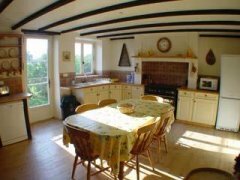 Surrounding Area: All the properties offer views of wooded valleys and countryside whilst being only a 5 minute walk to the village boulangerie, épicerie and bar. 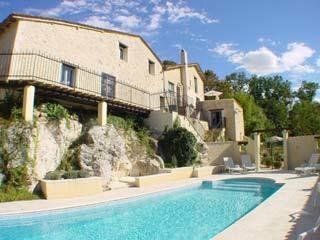 Les Roches is set on the edge of the bastide village of Fonroque. Throughout the year there are events and daily markets nearby. The picturesque medieval bastide town of Eymet is only a 5 minute drive away with its restaurants, bars, markets (day and night) shops and schools. The charming Dordogne riverside town of Bergerac is only 15 minutes drive away with its beautiful old town and quay, and airport with low cost flights to the UK from Stansted, Southampton, Bristol and Birmingham. The medieval towns of Issigeac and Duras are just as close. Issigeac market on a Sunday is bustling with local products and is a must to visit. Duras has a stunning château which is also well worth a visit. The infamous Château Monbazillac is close by with its fairy tale castle, spectacular views and winetasting. Further a field there is Bordeaux and St Emilion, although still only an hours drive away. The area is full of sporting activities with the championship golf course of Les Vigiers only 15 minutes drive away. There is also canoeing, horseriding and many other activities in the vicinity. Mains water. Septic tank. Electricity. Telephone. Satellite TV. VCR. Hi-fi. Telephone & Internet access by arrangement. 2 cots/highchairs, Sauna, Showeroom and Gym facilities, Summer Kitchen, Children's play area, private parking, Book,Games and Video library. Pricing Info: Farmhouse (5 bedrooms) €1,460, Chai (4 bedrooms) €1,170, Petit Chai €585 monthly rental for 5 full months rented, please ask about shorter rental periods. Gas, oil and taxes are inclusive. Gas for cooking and logs not included. Linen not included Paid monthly in advance with one month’s deposit in euros or sterling by arrangement.